SAN MARCOS: The City Council has approved naming the amphitheater at Double Peak Park after a former community services commissioner. 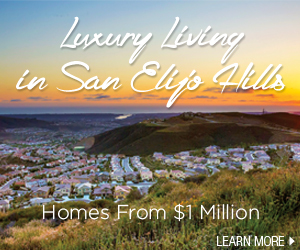 The 200-acre park on the Double Peak ridgeline in San Elijo Hills, scheduled to open June 19, has expansive views of the Pacific Ocean. There will be 190 acres of open space, and 10 acres of developed land with playground equipment, which will be installed soon. An engraved plaque bearing Mahnita Boyden-Wofford’s name will be placed on a boulder near the outdoor amphitheater. She was a commissioner for 39 years, until her death in 2007.